Kazuya Miyamoto debuted in 1988 as a member of JUN SKY WALKER(S). 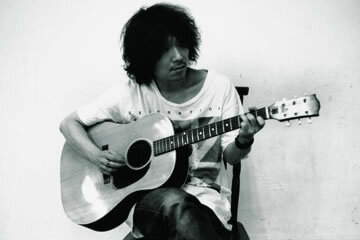 After the disbandment of the band in 1997, he continued his music career with his solo project and was active as Miyata JET, the vocalist of Jet-Ki until July, 2009 when the unit split up. In 2007, JUN SKY WALKER(S) was revived to celebrate the year of 2008 as their 20th anniversary year since their debut. On 9/1/2010, a brand new solo project album “Miyamoto Kazuya” in 10 years was released and its release tour was held throughout Japan. Miyamoto participated in a charity tour as a member of JUN SKY WALKER(S) in May, 2011. With the Golden Circle lives at Nippon Budokan on 10/25/2011 and 10/26/2011, JUN SKY WALKER(S) officially announced the full reunion of the band.